Children around the world have been giving orders to smart speakers, as more Amazon Echo, Google Home, Apple HomePod and similar devices are bought by parents. Now British broadcaster the BBC has launched its first voice-app for children, based on its pre-school CBeebies brand. It’s called BBC Kids, and for now it’s only available for Amazon’s Echo, through its Alexa voice assistant. 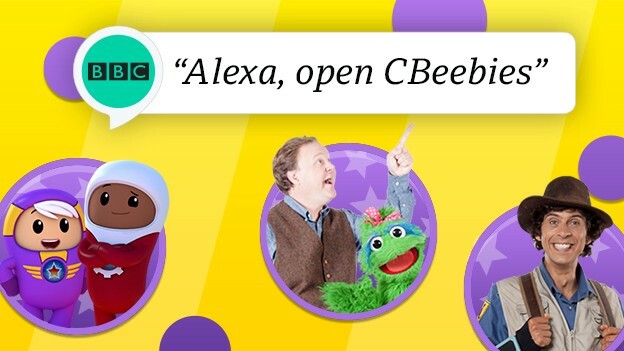 Once enabled (which you can do via the link above if you have Alexa devices – which now also include tablets and smartphones as well as Echo speakers) adults and kids alike can say ‘Alexa, open CBeebies’ to start it. At this point, the app (or ‘skill’ as they’re known for Alexa) has three voice-controlled games based on CBeebies shows and characters: Little Monster’s Hide and Seek; Andy’s Adventure Dance Party; and Go Jetter’s Glitchy Facts. More will follow in the coming months, according to the Beeb. “The technology is still new and we’re experimenting with what works well and what our audiences really want on these new platforms,” said BBC executive Mukul Devichand, who’s in charge of the broadcaster’s voice and artificial-intelligence projects. There has been some debate about whether children should be interacting with smart speakers and voice assistants – I wrote about a recent conference session discussing that issue here – so the BBC is carefully stressing that it wants its skills for children to be something parents will feel good about. “They involve elements of play that we know children love, like dancing, music and quizzes, but also help children to listen and identify sounds, to pay close attention, learn facts… and of course, have some fun,” said the BBC’s director of radio and education James Purnell today. 11% of Brits now own at least one smart speaker, according to a recent study by research company YouGov. Another research firm, Canalys, recently claimed that there’ll be 100 million of these devices in people’s homes across the world by the end of this year. And that’s without counting other devices that work with Alexa and Google’s equivalent (Google Assistant) like tablets and smartphones. Talking of Google Assistant, for now BBC Kids is Alexa-only. But the BBC is a public-service broadcaster with strict rules governing its tech projects. So, just as its mobile apps have always been on Android devices as well as Apple’s, I suspect we’ll see BBC Kids on Google Home speakers as soon as it’s possible for the Beeb’s team to get it working.